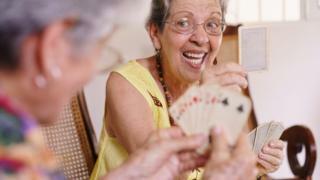 Playing simple card games, such as snap, can help stroke patients with their recovery, say Canadian researchers. The scientists found it improved patients' motor skills. Playing Jenga, bingo or a games consol like Wii worked equally well. They told the Lancet Neurology that the type of task used for motor rehabilitation might be less relevant, as long as it is intensive, repetitive and gets the hands and arms moving. The researchers designed their study to test whether virtual reality gaming, which is increasingly being employed as a rehab therapy for stroke patients, is any better than more traditional games for honing upper limb motor skills. The Canadian team recruited 141 patients who had recently suffered a stroke, and now had some impaired movement in one or both of their hands and arms. Approximately half of the patients, at random, were then allocated to the Wii rehab, while the rest were asked to do other recreational activities, such as playing cards. All of the patients continued to receive usual stroke rehabilitation care and support on top of the 10, one-hour sessions of gaming or card playing for a fortnight. Both groups showed significant improvement in their motor skills at the end of the two weeks and four weeks later. Importantly, both groups fared equally well, say the researchers. While it's not clear from this study how much of the improvement was from the regular stroke care the participants received, other research suggests adding in more therapy is beneficial. Investigator Dr Gustavo Saposnik, from St Michael's Hospital in Toronto, said: "We all like technology and have the tendency to think that new technology is better than old-fashioned strategies, but sometimes that's not the case. In this study, we found that simple recreational activities that can be implemented anywhere may be as effective as technology." Alexis Wieroniey of the UK's Stroke Association said the findings were particularly encouraging because they suggest that inexpensive, easily accessible activities can help some stroke survivors in their recovery. "Thousands of stroke survivors are left with mobility problems, and this can lead to a devastating loss of independence," she added. A stroke occurs when the blood supply to part of the brain is cut off either by a clot or a bleed. This can cause symptoms such as drooping of the face muscles, slurred speech and numbness and weakness of the arms. Stroke is a medical emergency that needs urgent attention and treatment. People may need a long period of rehabilitation to regain independence. Some will have permanent impairment.